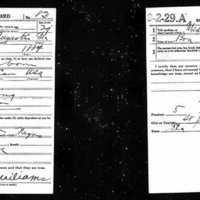 The draft registration card for Buster Williams (1887-1945). The card contains the demographic information for the soldier including name, age, home address, date of birth, place of birth, race, citizenship, trade or occupation, number of dependents, whether tall, medium, or short, slender, medium, or stout, eye and hair color, whether bald, and disabilities. World War I draft registration cards were completed by approximately 24 million men living in the United States in 1917 and 1918. Buster Williams was born on December 16, 1887, in Barnwell, South Carolina. He worked as a farmer in Elkton, Florida, before being drafted into the United States Army in St. Augustine, Florida, on June 19, 1918. Williams served for about two months in the 135th Depot Brigade, a unit responsible for processing and training new recruits. From August 18, 1918, until the end of the war, he was part of Company B of the 536th Engineers Service Battalion. The 536th boarded their ship for France on August 26, 1918. The unit likely worked at the St. Aignan depot, where they would have been responsible for loading and unloading equipment and serving in primarily a support capacity. Once the war ended, Williams returned to Florida, where he married his wife, Ethel, and had three children. Williams worked as a laborer for a cemetery. He, his wife, and his son-in-law remained in the same house until Williams's death on December 28, 1945. He is buried in the St. Augustine National Cemetery. In 2017, the University of Central Florida was one of three universities selected to launch the National Cemetery Administration’s Veterans Legacy Program Project. The program continues, engaging a team of scholars to make the life stories of veterans buried in national cemeteries available to the public. The project engages UCF students in research and writing and fosters collaboration between students, faculty and local Central Florida schools to produce interactive curriculum for k-12 students. The corresponding website exhibit uses RICHES Mosaic Interface to create a digital archive of related data. The public can use the project-developed augmented-reality app at more than 100 headstones at four national cemeteries, two in Florida (Florida National Cemetery and St. Augustine National Cemetery) and two in France (American Battle Monuments Commission cemeteries at Aisne-Marne and the Meuse-Argonne), where they can access the UCF student-authored biographies of veterans. Digital reproduction of original draft registration card: Selective Service System, World War I Selective Service System Draft Registration Cards, 1917-1918, M1509, 4,582 rolls. Originally created by C.W. Leonard and published by the War Department, Office of Provost Marshal General, Selective Service System. American Battle Monuments Commission. American Armies and Battlefields in Europe: A History, Guide, and Reference Book. Washington, D.C., 1938. Army War College. Order of the Battle of the United States Land Forces in the World War [Vol. 1-2], American Expeditionary Forces. Washington, D.C.: U.S. Army Center of Military History, 1931-1949. "Buster Williams (1887-1945)." Online database with images, Find a Grave. Accessed August 6, 2018. https://www.findagrave.com/memorial/17264125. Florida Department of Military Affairs. "Buster Williams." Online database with images, FloridaMemory. New Augustine, Florida. Box 16. Accessed August 6, 2018. https://www.floridamemory.com/items/show/222633. Office of the Quartermaster General. "Buster Williams." U.S. Army Transport Service Passenger Lists, 1910-1939. Online database with images, Ancestry.com. Hoboken, New Jersey. Record Group Number 92, Roll or Box Number 507. Accessed August 6, 2018. https://search.ancestry.com/cgi-bin/sse.dll?indiv=1&ampdb=NARAWWITroops&amph=1483191. Office of the Quartermaster General. "Buster Williams." U.S. Army Transport Service Passenger Lists, 1910-1939. Online database with images, Ancestry.com. St. Nazaire, France. Record Group 92, Roll or Box Number 140. Accessed August 6, 2018. https://search.ancestry.com/cgi-bin/sse.dll?indiv=1&ampdb=NARAWWITroops&amph=7414092. Selective Service System. "Busetr Williams." U.S. World War I Draft Registration Cards, 1917-1918. Online database with images, Ancestry.com. NARA microfilm publication M1509, Roll 15569277. Accessed August 6, 2018. https://search.ancestry.com/cgi-bin/sse.dll?indiv=1&ampdb=WW1draft&amph=70930822. U.S. Census Bureau. "Buster Williams." 1920 United States Federal Census. Online database with images, Ancestry.com. New Augustine, St. Johns, Florida. NARA microfilm publication T625, 2076 rolls. Accessed August 6, 2018. https://search.ancestry.com/cgi-bin/sse.dll?indiv=1&ampdb=1920usfedcen&amph=4091921. U.S. Census Bureau. "Buster Williams." 1930 United States Federal Census. Online database with images, Ancestry.com. St. Augustine, St. Johns, Florida. NARA microfilm publication T626, FHL microfilm 2340067. Accessed August 6, 2018. https://search.ancestry.com/cgi-bin/sse.dll?indiv=1&ampdb=1930usfedcen&amph=7865448. United States Army. 536th Engineer Service Battalion Historial Technical Report, 1919. W.E.B. Du Bois Papers. Accessed August 6, 2018. http://credo.library.umass.edu/view/full/mmums312-b219-i076. Leonard, C.W. and War Department, Office of Provost Marshal General, Selective Service System. “Draft Registration Card, 1917-1918 .” RICHES of Central Florida accessed April 18, 2019, https://richesmi.cah.ucf.edu/omeka/items/show/10361.